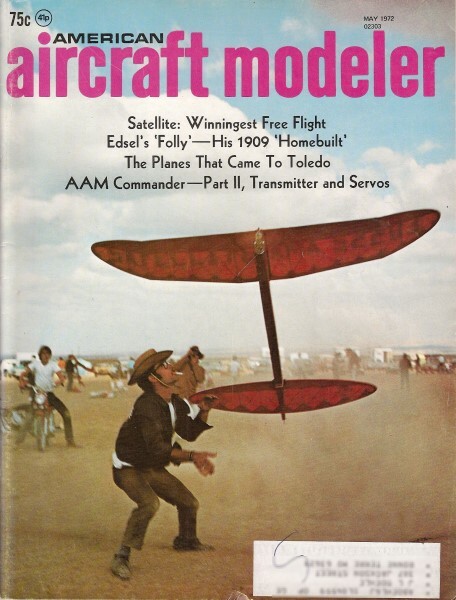 Airplanes and Rockets visitor Jochen S., a school teacher from Germany, wrote to request that I scan this Super Sabre Trainer (SST) article that appeared in the May 1972 edition of American Aircraft Modeler. 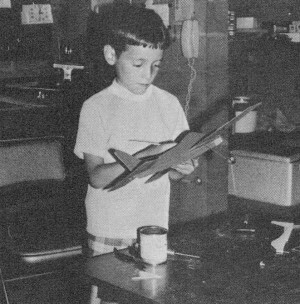 The Super Sabre Trainer is a ½A control-line model designed by Dean Swift for his 6-year-old son to learn to build and fly C/L airplanes. It is a simple, profile fuselage with sheet balsa surfaces. Jochen wants to use the SST in a program to introduce students to aircraft modeling. He says they will also benefit from trying to read the article in English and to convert inches to metric units. Toll! 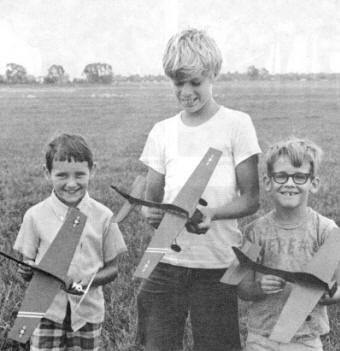 Designed by a 43½-year-old avid free-flighter for his 6-year-old son to fly. He did (fly) and so can you. A carefully designer trainer. First step is to cut out all the parts. With pliers, bend the gear wires to shape. 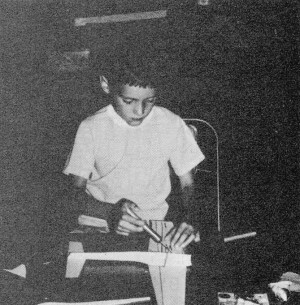 Here he's gluing his fuselage. Top of fuselage and rudder are glued over the wings. Painting is most important to prevent fuel from soaking into the wood. Alright, let's face it. ½A U-Control trainers are a dime a dozen. Construction goes something like this: Peel the bark off the wood and paint until your arm gets tired. This results in a heavy, sluggish flying plane. Due to the extra weight should the flier make a miscue, this type of plane has been known to attack the ground with extra vigor, and the flier goes home carrying more pieces than he started out with. So there you are back in the basement with a heap of trash. Despair hangs heavy in the air. Is it all worth it? But wait! Isn't that a cloud of dust on the horizon? It is! It's the SST (Simple Sabre Trainer) - the solution to all your problems. The SST is lightweight (notice the thinner sheets) and flexible, but not weak. Check that spoon-type fuselage construction - the SST gains its strength through brains not brawn. Sleek lines don't cost extra either. It has a tricycle landing gear for real jet-like appearance and smoother takeoffs and landings. And fly? You haven't seen anything like it west of the Pecos. With a zippy engine and an experienced wrangler on the handle, the SST will loop, fly inverted, and do a recognizable figure eight. Yet it is a tame old mare for the Tenderfoot. One more thing before you start to build. I'll make a deal with you. If you promise to pick out the lighter sheets of wood at the hobby shop, and go easy on that colored dope, I'll tell you a secret if you haven't already guessed. 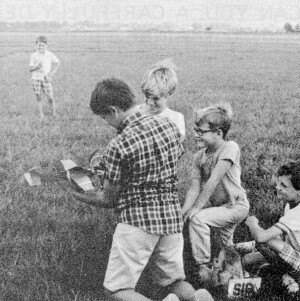 The SST was designed by a 43½-year-old avid free-flighter for his six-year-old son to fly. He did it and so can you. The SST goes together quickly. Begin by cutting the wing and stabilizer from 3/32" sheet balsa. 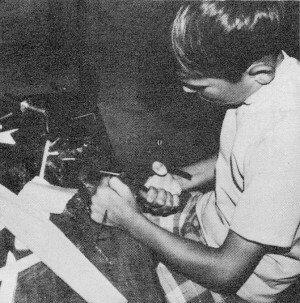 The outlines may be transferred by first laying the balsa under the plans, then, using a com­mon pin, punch through the plan into the wood along the outline at approximately one-inch intervals. Remove the plans and cut between pin holes using a razor blade or hobby knife and a straight edge such as a ruler for a guide. 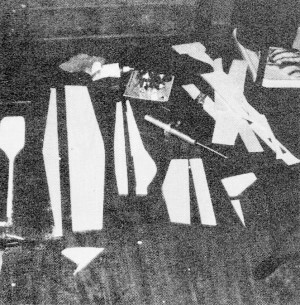 Cut out the spoon and lower half of the fuselage using the same procedure. Lay the plans on top of the spoon and mark the "V" groove for the landing gear with your pin. The "V" groove may be made by scoring the spoon with the end of a screwdriver or a dull pencil point. Be sure to cut the angle on the front of the spoon for thrust offset. The main landing gear is next. Cut a piece of 1/16" music wire 10½" long. Bend at the center into a "V" shape which matches the "V" on the spoon. Mark the wire where it crosses each edge of the spoon and bend back 90 degrees at these marks. All you need do now is bend the ends of the wire up for the axles as shown on the front view of the landing gear. While you have the wire handy, bend the nose gear as shown. If you don't have a wire bender you may omit the coil. You now have enough parts to begin assembly. The wing and fuselage assembly is built upside down. 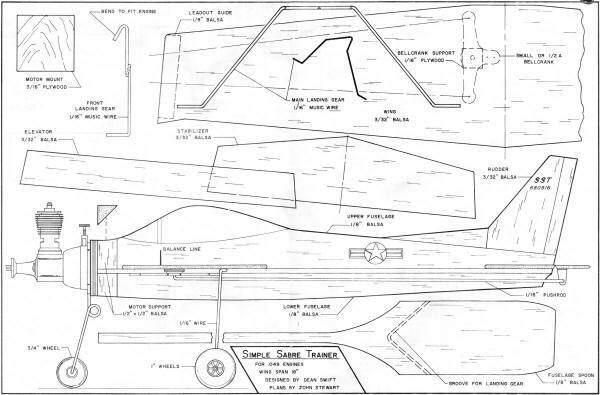 Draw a center­line on the wing and stabilizer as shown on the plans. Draw a line 14" long on your work board. Pin wing and stabilizer to work board upside down (with their centerlines up). These centerlines should, be parallel to and directly above the line drawn on your board. Be sure that the distance between the trailing edge of the wing and leading edge of the stabilizer is the same as shown on the plans. 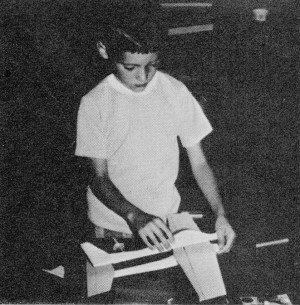 Glue the spoon to the wing and stabilizer with the main gear sandwiched in the "V" groove between the spoon and the wing. Next glue on the lower half of the fuselage. Remember that the whole assembly is upside down on your work board at this point. While this is drying, cut out the upper half of the fuselage (be sure to notch for the wing); also cut out the rudder, elevator and motor mount. Glue the rudder to the upper half of the fuselage. 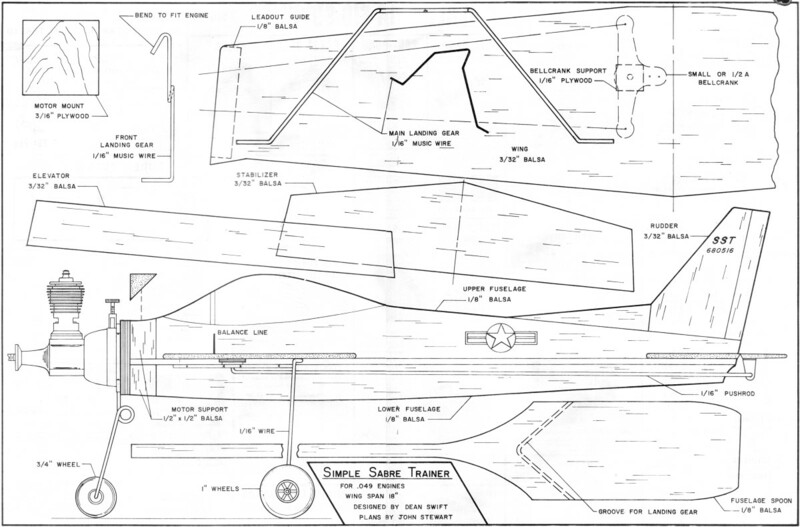 "When viewed from the rear, the rudder tab should be offset 1/8" to the right. When the fuselage-wing assembly is dry, remove the board and glue on the top half of the fuselage and motor mount. After it is dry, complete the basic structure by adding the ½ x ½" triangular motor mount supports and the elevator (cloth hinges may be used). Now is the time for sandpaper. Sand the entire plane lightly. Next add the bellcrank mount, the bellcrank, 1/16 pushrod, control horn and lead-out guide. The lead-out guide is scored to allow passage of the lines. It's painting time - let's keep it light while trying to make it pretty. One or two coats of clear dope (mixed about three parts dope and one part thinner) with a light sanding after each coat is enough. Then one or two coats of color thinned in the same manner. Use red, blue or any other darker color as they tend to cover faster with fewer coats. Install motor with four wood screws. Wheels are added next, and then you're ready to fly. Balance the airplane at the line shown on plans. Add weight to the nose or tail as required. Use 20 to 25 ft. ½A nylon control lines. Early test flights should be flown when winds are light and calm. The SST will RoG (rise off the ground) or may be hand launched. Always release on the downwind side of the circle with the plane pointed slightly outward from the flier. Control movements may be limited during the first flights by sticking two straight pins through the wing to limit the movement of the bellcrank. As your confidence builds, you may remove the pins and add a 3/8" wide strip of balsa to the trailing edge of the elevator for more aerobatic flying. Apparently this group of beginners shares one engine.